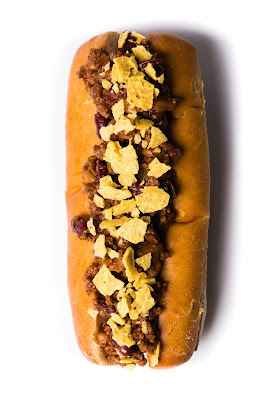 Not Dogs: Not Dogs Sausage Showcase: The Cha-Cha Chilli Dog! Not Dogs Sausage Showcase: The Cha-Cha Chilli Dog! We were inspired to create our ‘meatiest’ dog yet for a series of Freshers' Weeks at universities last year. We wanted to offer students something warming and satisfying as the Autumn months got colder - all using Quorn of course! The Cha Chilli Dog is made up of our famous Not Dog, topped with home-made chilli con-carne (made from Quorn mince) crispy nachos and finished off with a sprinkle of chilli flakes, perfect for this time of the year! With this menu favourite, we double our use of Quorn which actually make it a very meaty Not Dog, popular with our meat-eating fans, but still completely 100% vegetarian too! Why ‘Cha-Cha Chilli’ you may ask? Well that’s because it’s so tasty it dances all over your mouth! Not Dogs in the Kitchen!